This system was visited for the first time on EDSM by timewarp01. Het Galactisch Cartografie Project heeft het Jaques Station / Animula Spires / The Mosta-Murdoch Raceway genoemd. 9651 ships passed through Colonia space, including 177 ships in the last 7 days. 37 ships passed through Colonia space in the last 24 hours. Jaques is a barman, a property owner and a cyborg. Back in the year 3200, Jaques had been running the same bar in the same starport for an inhumanly long period of time. His tale was recounted in the “Stories of Life on the Frontier” booklet included with 1993’s Frontier: Elite II, wherein we learn Jaques owns half the starport and plans on taking it on a voyage across the galaxy just as soon as he buys the rest. Twenty-two years after David Massey wrote the short story “All That Glisters...” in Stories of Life on the Frontier, Jaques is doing just that. It took a little longer than expected (the old Coriolis Station wasn’t robust enough to take the drives he wanted…) but he got there in the end. Several waves of settlers have followed in the footsteps of Jaques and established themselves in Colonia region. These days more than 70 systems have been settled and more than 100 settlements can be found planetside or in space. Colonia became a hive of activity during mid-3302 after the discovery by CMDR Cly of Jaques Station following the starports misjump to Beagle Point earlier that year. It is located on the edge of the galactic core regions, where the Near 3kpc Arm and Far 3kpc Arm converges with the Galactic Bar. 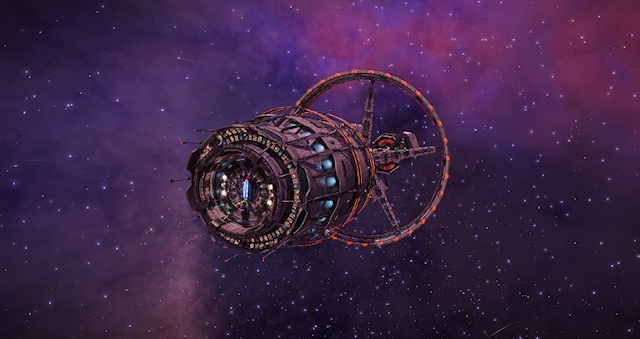 Its original designation was EOL PROU RS-T D3-94, but was added to the Galactic Mapping Project on July 1st 3302 as a POI (unofficially) named "Colonia", and the name was quickly adopted by the exploration community. The name subsequently became official via Universal Cartographics (Frontier Developments) several weeks later in recognition of the CCN (Colonia Citizens Network) community initiatives to name and colonize the region. When people refer to 'Colonia' it may have several meanings depending on how broadly the term is being used. In its most narrow sense, it may refer only to the Colonia system itself - this is the star system where Jaques Station is located. The star system has in turn given name to the nebula it is located within - the Colonia Nebula - and in a broader sense, 'Colonia' may refer to all the inhabited systems within this nebula. 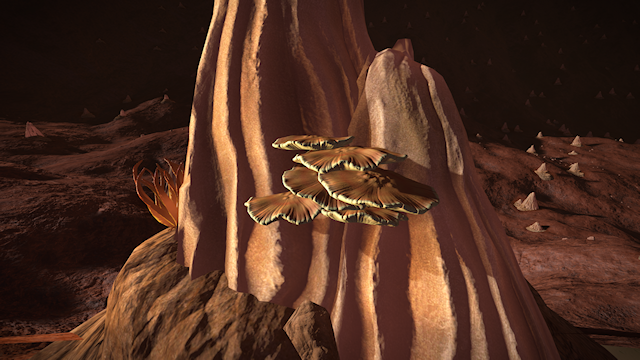 Located within the Colonia system are the famous 'Animula Spires' - the first fungal life found in deep space. These tall spires are covered with various types of fungal growths resembling those found on Earth and other planets, apparently thriving on the volcanic warmth and minerals around the silicate vapour geysers of the area. Samples of the life have been turned over to the Colonia Counsel for examination. Pilots are encouraged to not disturb the flora as it is currently unknown how rare these life forms are or how quickly they grow. Any materials gained could be gathered the normal way via prospecting rocks that dot the planet's surface rather then destroying such a rarity. Note: Recent visits to the site shows that all trace of the fungal life once so abundant in the canyon has mysteriously disappeared. Scientists are alarmed by this and fear that the fungus has been harvested by criminals seeking to sell it for profit. The Mosta-Murdoch Raceway (affectionately named 'Tracky McTrackface' by the local community) was the first racing circuit mapped out and used by colonists out in the Colonia Nebula. The raceways inaugural event, a Viper canyon race, was held on Sept. 4th 3302. The track was designed by CMDR Mosta of the Colonia Citizens Network events team, and the inaugural event held there was won by CMDR Jadmurdoch.